We’re into the beginning of a new year—a time of reflection on the ups and downs of the previous year, and a time to set goals for the coming months. If finding that “special someone” is on your list of resolutions this year, you’re not alone! January 1 signaled the beginning of coyote courtship and mating season here in Metro Vancouver. Coyote mating season runs from January 1 until April 30 in our neck of the woods. This year, some new couples will establish—younger coyotes will form new pair bonds and begin a fresh family unit. Pairs from previous years will also be courting and mating again. Perhaps most amazing of all: these coyote couples are in it for life. 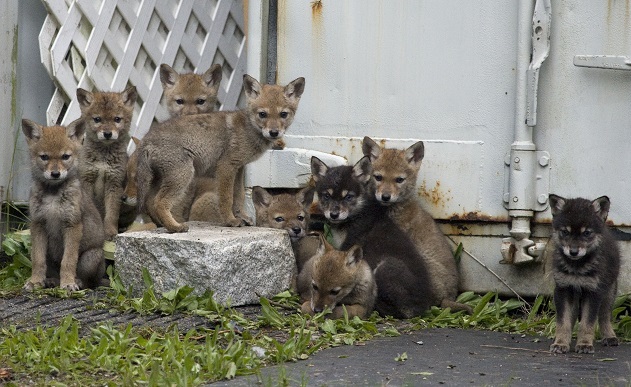 A 2012 study of coyotes in the Chicago area showed they were 100% faithful to their mate! The male and female alpha pair will raise several litters of pups together, and live with one another throughout the year. As their pups grow, some of them will depart the family and begin their own, while others will stay with their parents and help to raise newer pups. Mating, and then pupping, seasons also signal a typical time of heightened conflict between coyotes and people in urban settings. Coyotes may be more aggressive during this season as mothers are more protective of their dens, and they are out looking for food. So what’s a city-dweller to do? If you begin to see coyotes regularly while you’re outside, consider making a coyote shaker—fill a can with rocks and coins, tape it up and carry it with you. If a coyote is getting a little to close for comfort, stand your ground, make yourself look big, and shout at the coyote while shaking the can. This should be enough to scare it off. You can also do coyotes a big favour and let them find their own food. Rats and mice–their favourite meal–are plentiful in the city. Ensure you have all garbage and compost secured, and no other food sources available for them outside, (e.g. pet food, fruit or vegetables). If you see a coyote, call 604-681-9453 or visit our website to fill out an online report form. Our interactive map will help you to see where these animals have been active, and you can add your own information to it as well. Feel free to contact Co-existing with Coyotes for any further information, and happy courting!